Our passion is to provide quality dental care for our community. Our conservative dental philosophy is based on only treating defined dental needs and never recommending unnecessary treatment. We are accepting new patients and welcome you and your family to join our practice. Brandon K. Farrell, DDS has over fourteen years experience as a dentist. After graduating with a Bachelors of Science in Biology from Indiana University in Bloomington, Indiana, Dr. Farrell obtained his DDS from Indiana University School of Dentistry in Indianapolis, Indiana. After graduation, Dr. Farrell served in the U.S. Navy Dental Corps as a Dental Officer. His four years of service included duty at the Pentagon and Marine Corps Air Station in Cherry Point, where he first fell in love with North Carolina. Dr. Farrell was deployed to Kuwait in support of Operation Iraqi Freedom in 2003, serving six months abroad. Upon his return, Dr. Farrell practiced at a family dental practice in Bloomington, Indiana for three years before returning to North Carolina with his wife and children in 2006. 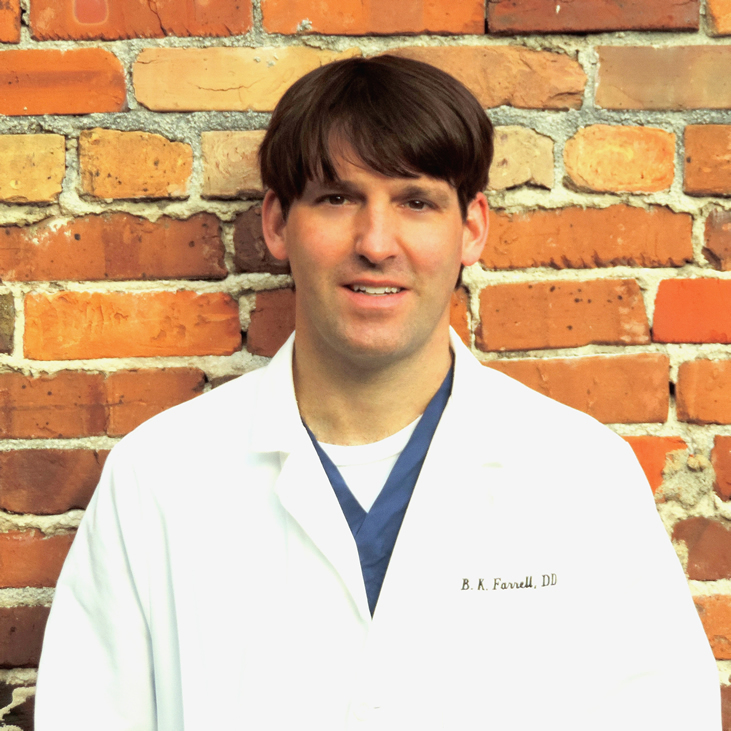 In his spare time Dr. Farrell enjoys spending time with his family, running, Indiana University sports, and antiques. Brush Dental Care realizes that everyone's financial situation is different. For this reason we have worked hard to provide a variety of payment options to help you receive the dental care you need and want with respect to your budget and insurance coverage. We were recently nominated as a “Top 3” Finalist in Coastal NC as a “Best Of” dental practice. We love to hear what our clients are saying about us! If you have had a good experience with us then write a Google Review! Top notch office! Dr Farrell is a great dentist with a gentle touch. Sara one of his outstanding hygientists cleaned my teeth during my last visit. She is very good at her job and it shows. One of the few places that I do not mind calling and dealing with the staff. Great people giving great care. I love this place! I currently do not have dental insurance and I go to school full time. The entire staff worked with me and gave me an affordable price that I was able to afford working a low paying job. The staff was extremely nice to me and knowledgeable. I normally and scared to death of doctor and dentist offices but the staff makes you feel comfortable. I would defiantly recommend this place to people that are scared of the dentist and who have small children.